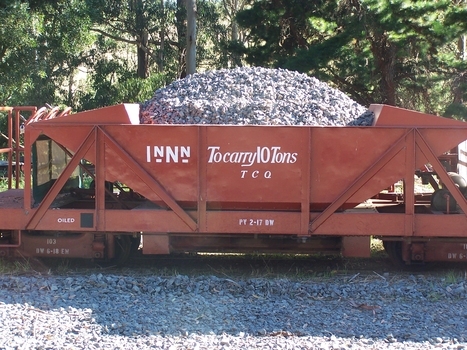 Narrow gauge railway history and associated industry equipment / artifacts primarily from Victoria but extending to the greater Australasia region. 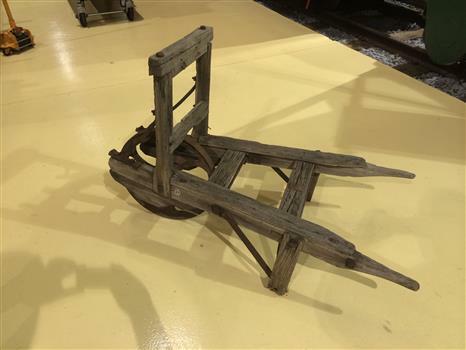 Hand Rail Drill Out on the track in the old days, it was sometimes required to drill some holes in a piece of rail so that two rails may be joined together by a metal joiner – called a fishplate. Before the use of generators and oxy cutting, the only way to do this was with a hand drill. 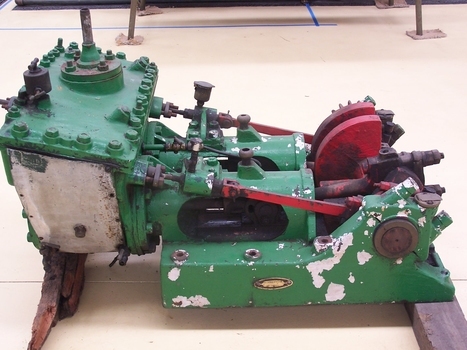 This is the machine operated by two people, that would drill a hole in the rail. With two to three holes to be drilled in each rail end (ie 4 or 6 holes), it was a tiring, back breaking job. And then there was usually the rail on the other side of the track to be done! 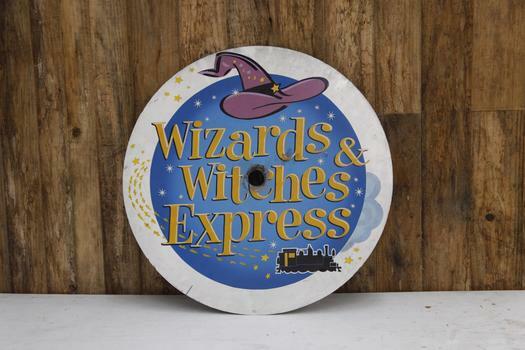 Locomotive Head Board - Wizards and Witches Express Round tin sign with blue, white, purple, yellow and black. 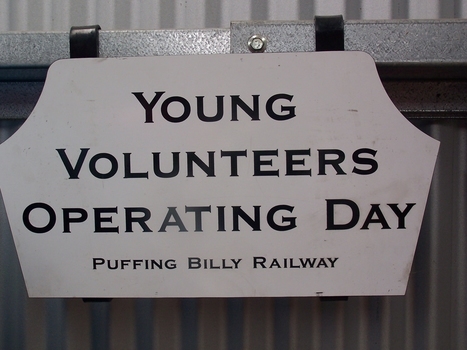 Historic - Puffing Billy Railway Locomotive Head Board used in the Celebration of Special Children's train day Used on the smokebox door of the locomotive during the running of the Wizards and Witches Express trains. 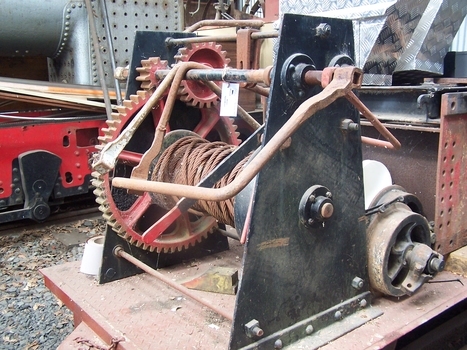 Imported by Cameron, Sutherland & Seward Ltd. Machinery Merchants, Melbourne & Sydney, this example is of the type of hand winch used by the Australian Industries and timber workers in the Australian bush. The central rotating drum is operated by three interacting cog wheels. The metal cable is wound onto the central drum. 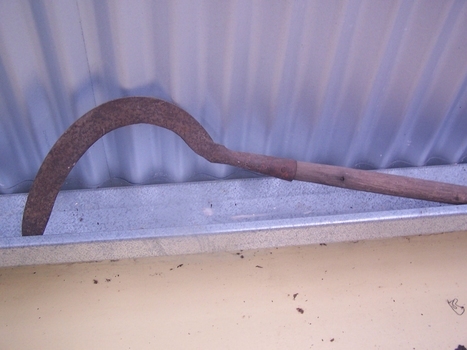 Historic - Hand Winch type of hand winch used by the Australian Industries and timber workers in the Australian bush. Ganger's Trolley Turntable When a railway gangers trolley was working between railway stations, occasionally it was required for the line to be clear for trains to operate. 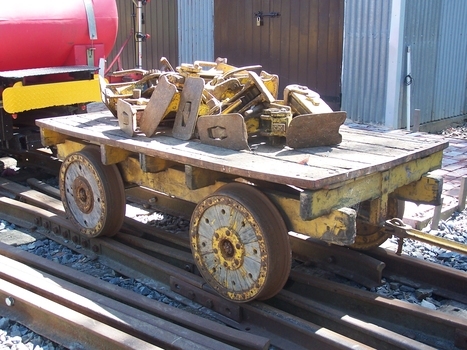 Many trolleys were too heavy to physically lift off the track, so a turntable was needed. 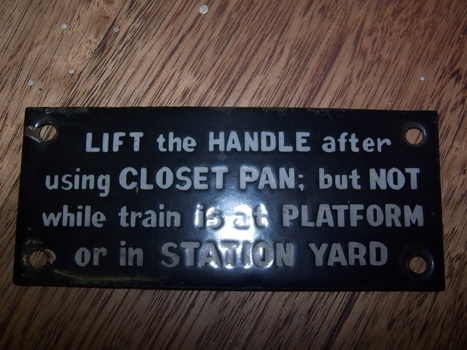 These were provided at designated locations, and in some cases the trolley had a turntable on board. 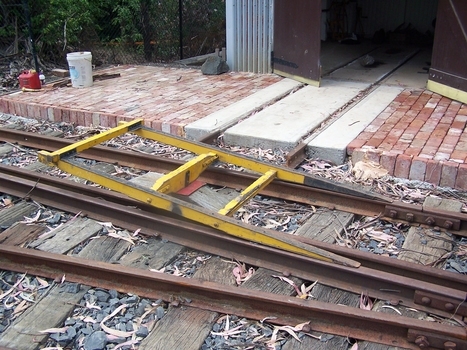 The turntable would be placed on the rails and the trolley driven onto it. 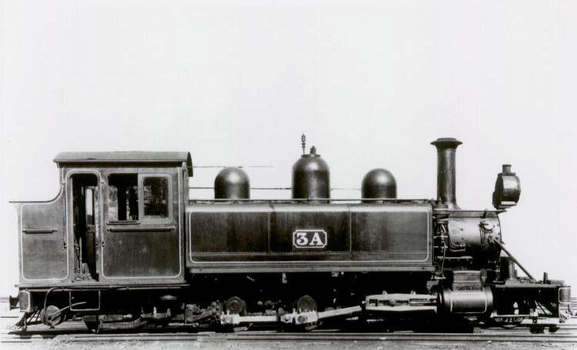 The turntable would then be rotated 90 degrees by human power and the trolley pushed off on to a prepared set of rails on the side of the line. 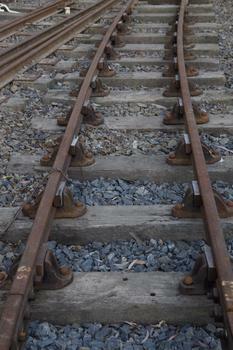 The turntable would then be removed from the track allowing trains to run through that section. The gang could then get on with the work required near that location. 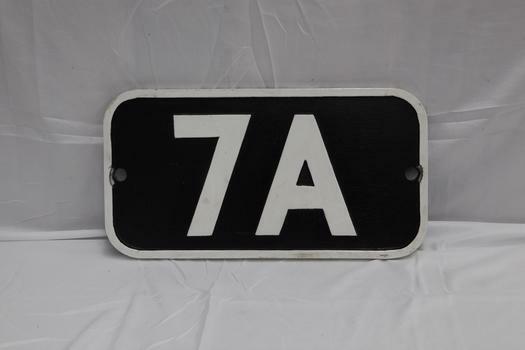 Number Plate 7A Rectangular black and white number plate. Cast aluminum replica number board. Replica of a Victorian Railways replacement number board that 7A carried in the later 40's and 50's. This plate was created for the preservation society's reenactment trains in 2012 for the 50 year celebration of reopening to Menzies Creek. Loco: 7A In service Saturday, 6th May 1905 Livery Maroon Owner Puffing Billy Gauge 762 Status Preserved - Operational 7A Built in 1905 and painted Canadian red & dark brown, this locomotive was issued to the Wangaratta to Whitfield line and saw service on all four lines with most of its service on the Upper Fern Tree Gully to Gembrook line. 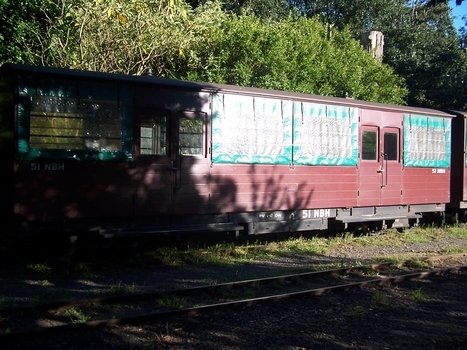 It was temporarily withdrawn from service in 1958 and returned to service at Belgrave in 1962 for the reopening of this line where it has seen almost continuous service since. 1979 saw the early two-tone green colour scheme applied to this loco as a trial even though it never historically carried it, but its physical configuration was not altered accordingly. 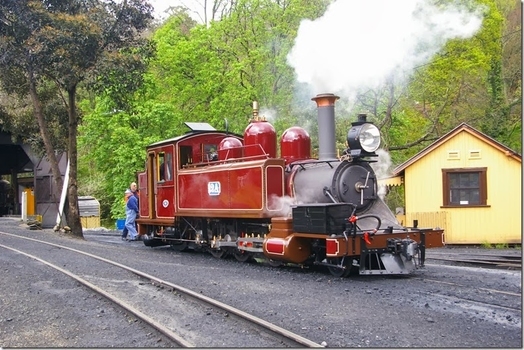 It is now painted its original livery of Canadian red & dark brown and will eventually be returned, as far a possible, to its original condition with a low bunker, narrow ash-chute, etc. Electric Clock - Smiths Setric Clock It is round with the numbers one to twelve, three hands with a white face. Electric Clock - Smiths Setric Clock From 1937 the trademark "Sectric" appears on their synchronous models.Usually on the dial but sometimes also on the back cover. Early clocks had a prominent "T" in sectric. Smiths English Clocks 1931 Smiths, then called S. Smith and Sons (Motor Accessories) Ltd, entered the domestic clock market and formed a new company, Smiths English Clocks Ltd, as the Clock and Watch division with Cricklewood as the main factory. 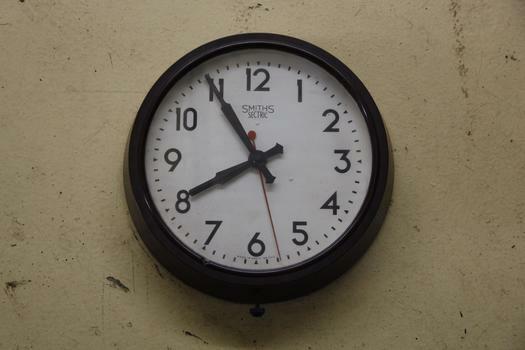 Smiths were one of the first companies to produce synchronous electric clocks. These were put on the market towards the end of 1931. Smiths formed a subsidiary company called Synchronous Electric Clocks to produce these clocks as the first models carry this name. 1932 Smiths purchased English Clock and Watch Manufacturers of Coventry, and acquired the trade names Astral and Empire. 1934 Smiths produced a synchronous alarm clock which they named the Callboy. 1934 They bought the Enfield Clock Co. The Smith's 8 day Calotte clock made its debut at the British Industries Fair in 1934. Prior to this date calottes had been exclusively of foreign manufacture. Also that year, Smiths introduced the Batriclock which was intended for areas where the synchronous clock could not be used. 1935 They introduced the Synfinity, which Smiths described as "the clock that never stops". They said it was "the remarkable combination of a synchronous electric movement with the essential elements of a fine precision lever escapement". If the electric supply failed the clock would run for up to six hours and rewind when the power returned. Apparently the synchronous motor also corrected the mechanical time train at intervals. Smiths produced a synchronous electric chiming clock. 1937 The trade name Sectric appears on Smiths electric clocks. Also the introduction by Smith's of a calotte clock with an alarm movement. 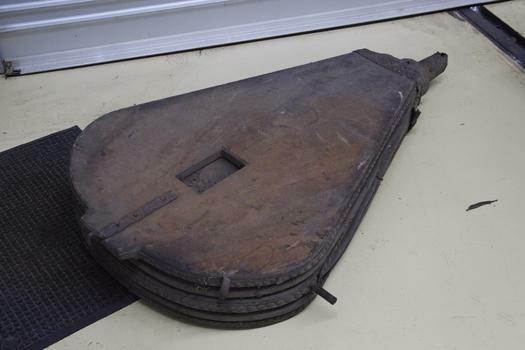 Wheelbarrow - Timber frame with Iron bracing and wheel. 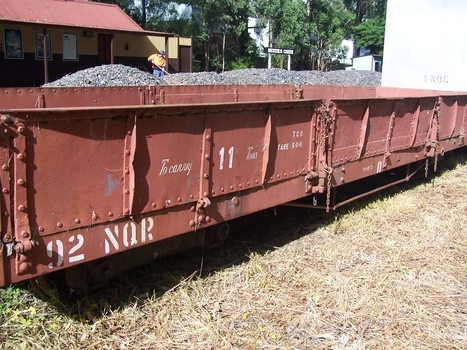 Victorian Railways - Narrow Gauge NA class steam locomotive number 12A Dates that 12A worked on the Gembrook Line Jan-1917 to Mar-1920 Sep-1926 to Mar-1938 Aug-1945 to Mar-1947 Mar-1949 to May-1950 Aug-1973 - Returned to service. Oct-1977 - Transferred to ETRB ownership. 6A Number Plate. 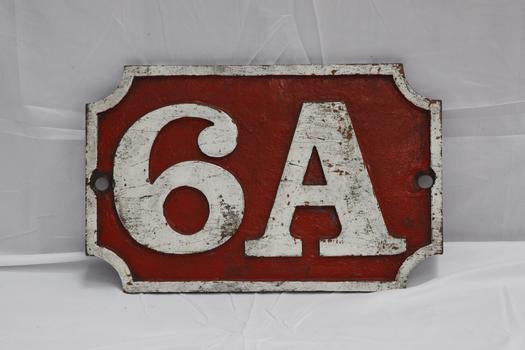 Fabricated steel number board made by the Victorian Railways for locomotive 6A. Historic - Victorian Railways Locomotive Number Plate used on Steam Locomotive 6A Loco: 6A In service Thursday, 18th July 1901 Livery Green Owner Puffing Billy Gauge 762 Status Preserved - Operational 6A Built in 1901 and painted two-tone green, this locomotive was issued to the Colac to Beech Forest line and was used in that line’s construction. 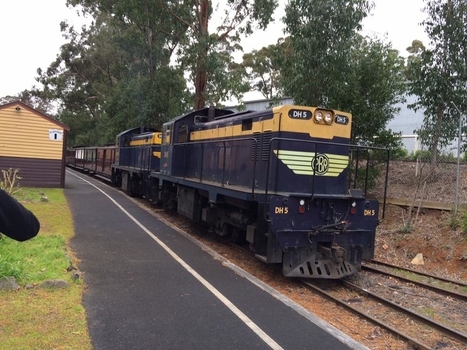 Over the years, it saw service on all four lines, but mostly on the Colac to Crowes and Upper Fern Tree Gully to Gembrook lines. It was temporarily withdrawn from service in 1958 and returned to service at Belgrave in 1962 for the reopening of this line where it saw almost continuous service until being withdrawn in 1983. It has been restored, as far as possible, to its original condition with original design side tanks, low bunker, original size windows, etc., but a steel cow-catcher in place of the original style wooden one. It also has its original colour scheme of two-tone green with white lining. Four NSWTD Railway marker Oil lamps made of metal and glass Railway lamp, paraffin, metal / glass / fabric, used for attaching to railway rolling stock to mark the end of the train, made by the New South Wales Transport Department, Sydney, New South Wales, Australia, 1870-1970 This lamp comprises a hollow cube of metal. One lens at the front transmits light from an interior light source. Fuel was either signal oil or kerosene. 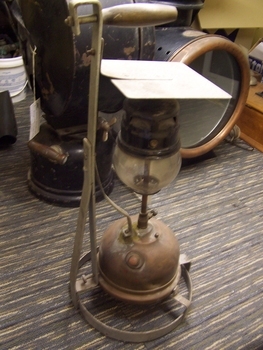 The burner inside the lamp used either cotton or felt wicks to create the light source. 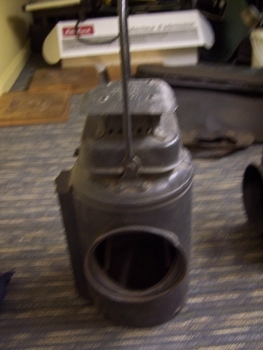 The lamp has a carry handle for carrying by hand and a bracket with a slot on the back for hanging onto the hook of a locomotive or item of rolling stock. 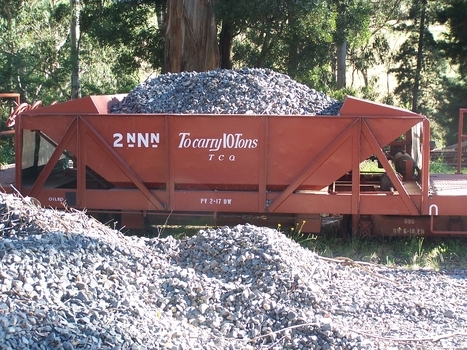 It is marked "NSWTD" which stands for New South Wales Transport Department. Four NSWTD Railway marker Oil lamps at Nobelius Packing shed Item stamped numbers unknown Oil burning lamps have always been an important part of Australian railway signalling systems and have been used for communication, safety and lighting. 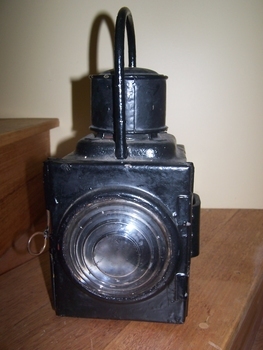 It is called a marker lamp and was hung on rolling stock (carriages and wagons) such as the guard’s van to indicate the rear of the train at night. 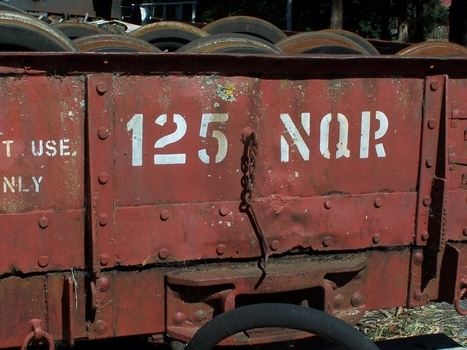 They were also used to indicate the rear of steam locomotive tenders for identification and safety purposes. 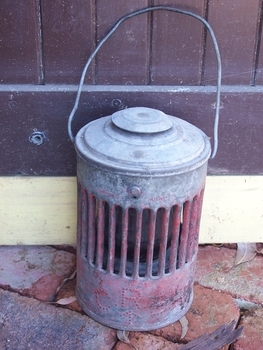 This type of lamp was introduced to the railways around 1860 and continued to be used for over one hundred years. Oil lamps were phased out on the railways during the late 1960s and early 1970s, when they were replaced by battery lamps. Railway lighting included not only stations but yards, engines, rolling stock, signals, signal-boxes and crossings. 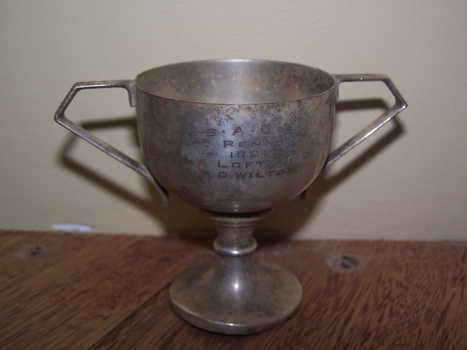 There were a number of different types of lamps used for a variety of railway purposes. 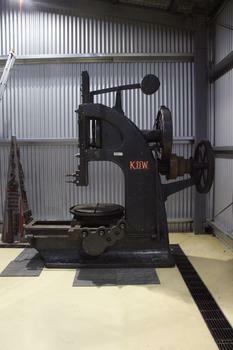 Hand operated drill press. 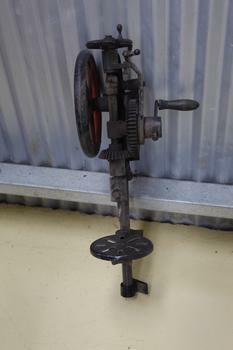 Bench mounted type hand drill press. 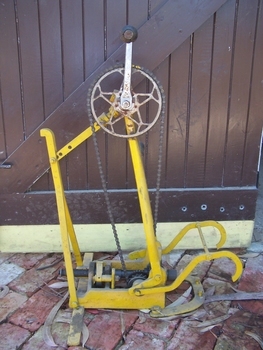 Historic - Industrial drill - typical hand operated design used in workshops.